Tratado clínico iconográfico de dermatología quirúrgica. Primera sección de las lecciones de clínica quirúrgica. Giné y Partagás, Juan, 1836-1903. Barcelona: La Academia de Evaristo Ullastres, 1880.
xii, 838 pp., [21 pl], ill. Illustrated: lithographs and three mounted albumens. Lain Entralgo, Historia Universal de la medicina, 1974: The 3 original photos in this volume are the first of their kind to be included in a Spanish medical work. Palau y Dulcet, Manual del librero hispano-americano 102411: description of the illustrations as a separate atlas. También, en mi deseo de ir atesorando materiales, en el curso de 1874 á 1875, me propuse hacer una Colección fotográfica de los enfermos de la "Clínica quirúrgica." Comenzaron los trabajos y llegaron á publicarse hasta diez y ocho fotografías, con sus correspondientes historias clínicas. Un incalificable "veto" de la Administración del Hospital de Santa Cruz, que no encontró en la autoridad universitaria un poder que le contrarestase cual convenia, dejó sin efecto mis esfuerzos. Por esto, hoy solo puedo publicar tres fotografías, únicas pertenecientes al grupo de las enfermedades de la piel de entre las que formaban parte de la iniciada colección. Barcelona 10 de Octubre de 1879...........Juan Giné. 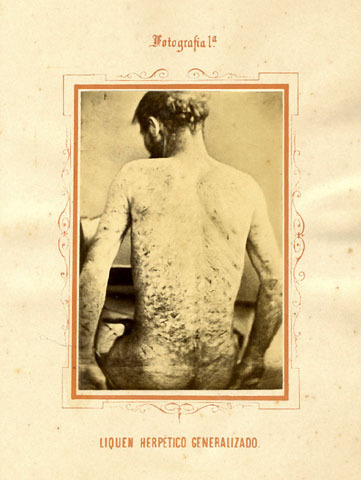 As he prepared this landmark work in Spanish medicine, Giné stated his intention to provide a more accessible and cheaper version of Dermatología General y Atlas de Clínica Iconográfica de Enfermedades de la Piel o Dermatosis which was compiled by his friend José Eugenio de Olavide in 1871. Giné was also modeling his ambition after Hardy and Montmeja's photographic dermatological atlas, Clinique photographique de l'Hôpital Saint-Louis, planning for an equivalent number of albumen photographs and including a section on the materia medica which issued from the labs of his Parisian colleagues. Unfortunately, his ambition was frustrated by an unanticipated "veto" from the Administration Hospital of Santa Cruz, which based its governance in this case on moral grounds and curtailed his access to the prostitutes in the venereal ward. He managed to procure only 18 photographs of which these three images alone were allowed for publication. The stature of this man of medicine cannot be called anything less than heroic. Besides his contributions to dermatology, he broad-shouldered the modernization of medical practice in Spain, introducing Lister's method in the 1870's and bringing in the first x-ray technology and telephony. In the field of psychiatry he established the first school for its study at the asylum New Bethlehem in Barcelona. Giné foundered the first psychiatric publication and wrote the first Spanish treatise on the subject and inaugurated the first psychiatric congress. He advocated for the Doctor of Medicine degree to be conferred to women and sponsored the admittance of women to the Barcelona School of Medicine. In spite of institutional resistance, Giné recognized the importance of photography in the practice and teaching of medical science and never gave up working for its acceptance. Although the images are accredited in the text to his brother Hermanos, in all likelihood the two men worked together for their production.